Hi everyone. I’m a regular walker in Tas. Heading into Junction lake in Tas again in April. Last few years I’ve started suffering from debilitating achilles pain. 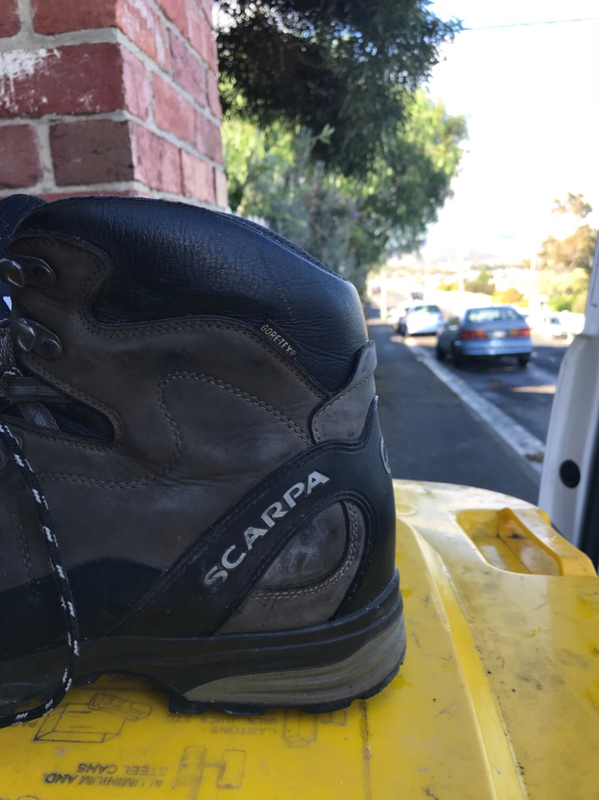 I’d bought new scarpas from Mpac a few years ago as everyone loved them but end up almost crippled with pain after walking in them. 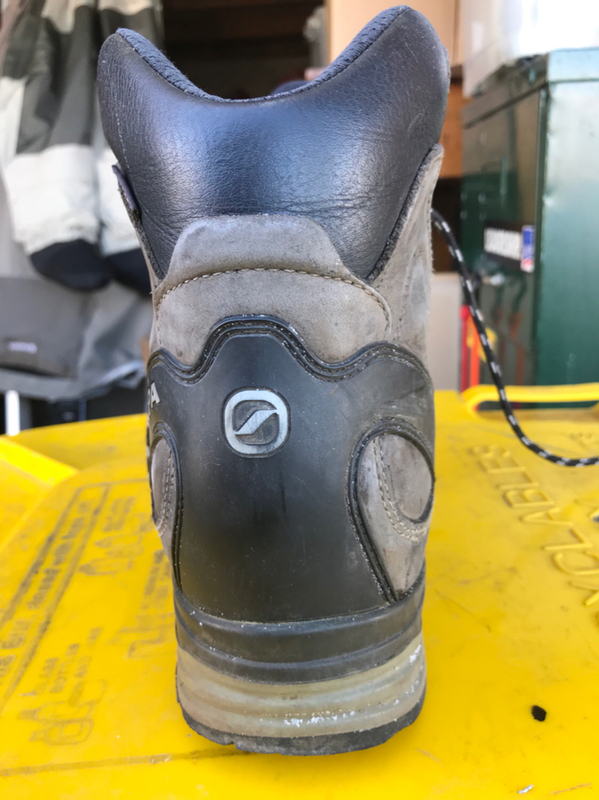 Anyone else got suggestions on boots that might help. You need to get checked out by an orthopedist. There are a number of things that could be causing your problems, and the best solution depends on identifying the cause. I hope those boots didn't end up in the bin they're sitting on? G'day, just a thought -you might be better to put this question in the general (first) "bushwalking discussion" thread where it may get a wider audience than the gear review section and thus hopefully better chance of getting some help. Good luck in easing that pain! north-north-west wrote: You need to get checked out by an orthopedist. There are a number of things that could be causing your problems, and the best solution depends on identifying the cause. +1 for getting it checked out properly. I went to a very good physio after my GP didn't have a lot to say about my on-going achilles pain. With the physio's advice, I've ended up in shoes instead of boots - for now at least. They wear out faster, but then they don't usually cost as much. I've only been able to find split leather with silly stitching to make it look pretty, or synthetics. None are particularly good for mud, multi-day scrub bashing etc. But they got me through the Eldon Traverse, Eastern & Western Arthurs and a bunch of out-of-the-way Abels I never thought I'd climb. So it is one possibility. I blew both of my Achilles on my first attempt at the Bibbulmun track, as in hard round little balls on each and agony to walk on. I did them 150k in and limped anither 50k until I pulled out.. Had to rest up and heal fir quite a few months. It turned out for me to be a result of a combination of things including quite simply how I was carrying the load of my back pack. When I look back at photos I can see that I was leaning forward to balance a heavy pack (we started with 10 days food in our bags) and my physio said after that my legs were overstretched down the back. I now carry a lighter load overall plus use an Aarn bodypack that has me much more balanced and walking upright I also did a lot of calf strengthening. So what I'm gettig around to is....what is causing the issue for you? It might be the boots (have you considered trying trail runners instead? boots can be very heavy on the ends of your legs) but lots of other factors can also contribute. In my case I also wasn't fit enough to be doing the distances we were doing. I have since revisited the Bibbulmun end to end successfully and rarely have even a twinge from my archilles. To make it flare up. Could be the combo of boots n weight. jobell wrote: I blew both of my Achilles on my first attempt at the Bibbulmun track, as in hard round little balls on each and agony to walk on. I did them 150k in and limped anither 50k until I pulled out.. Had to rest up and heal fir quite a few months. It turned out for me to be a result of a combination of things including quite simply how I was carrying the load of my back pack. When I look back at photos I can see that I was leaning forward to balance a heavy pack (we started with 10 days food in our bags) and my physio said after that my legs were overstretched down the back. I now carry a lighter load overall plus use an Aarn bodypack that has me much more balanced and walking upright I also did a lot of calf strengthening. So what I'm gettig around to is....what is causing the issue for you? It might be the boots (have you considered trying trail runners instead? boots can be very heavy on the ends of your legs) but lots of other factors can also contribute. In my case I also wasn't fit enough to be doing the distances we were doing. I have since revisited the Bibbulmun end to end successfully and rarely have even a twinge from my archilles. Cheers. Shoes in Tas! Whoa. I’d be worried about losing them in a mud hole. Perhaps I go that route. My podiatrist got me into Keens which have been great for general stuff. Mafeking09 wrote: Cheers. Shoes in Tas! Whoa. I’d be worried about losing them in a mud hole. Perhaps I go that route. My podiatrist got me into Keens which have been great for general stuff. I forgot to mention the other crucial piece of equipment - a walking pole. Very useful as a depth gauge for mud. It's amazing how often there's a bit of rock or old log or something buried a few inches below the surface. There are often ankle/calf deep spots right near thigh/waist deep spots (I'm short). It's slower, of course - which can be an issue if walking with a fast group or needing to cover long distances in a day. I recommend a Z pole that can be easily stashed inside my pack when bashing through thick scrub. But shoes have made years of amazing, spectacular, wild, remote Tassie walking possible. Even if you just try them in the short term, it might be worth it for your upcoming trip. I've had a few trips past Junction Lake, wearing my shoes. It's not easy to get excellent grip with shoes, but several are not bad. I invested in a pair of approach shoes for my attempt at Federation. (We pulled the plug on the final ascent because there was too much water running down the rock - but hopefully I'll be back!) Meantime, I use those for walks with lengthy boulder-hopping. The soles are softer for better grip, so they wear out quicker. The other thing is that different brands will suit different shaped feet, as they use different lasts. Scarpas are useless for me even without the achilles problem, because they're too narrow. Gaiters with underfoot straps will solve that issue.